The proliferation of lionfish in the Caribbean over the last ten years is a real and growing threat to the ecology of tropical and sub-tropical marine areas in the Wider Caribbean Region. Now that the entire region has been invaded, densities of lionfish in newly invaded locations are expected to increase quickly, as it was observed in the sites (e.g The Bahamas) that were invaded first. To date, no decrease in the densities of lionfish have been observed, and the densities seem to remain high over a sufficient period to create serious damage to reefs and fish species. Lionfish can cause damage, direct or indirect, to coral reefs, sea grasses and mangroves, due to their high rate of reproduction and growth, its voracious feeding capacity and lack of predators. The lionfish has high efficiency of predation of juvenile and adult fish and shellfish, including several species of ecological, recreational and commercial importance. As aggressive ambush predators with few predators of their own in their introduced range, lionfishes can quickly and alarmingly reduce local native reef fish (and some invertebrate) populations to the point where native piscivores cannot compete for these prey animals. This in-turn can cause a reduction in the growth and survival of the native predators. Stomach content analysis of lionfishes reveal a wide diversity in prey species and size classes. The impact occurs primarily at the ecological level, affecting populations of fish and crustaceans and disrupting the balance of the ecosystem, then comes an economic impact derived from the effect on the fishery and source of protein for coastal communities, as well as tourism by degradation of its natural attractions. Not only does it reduce the abundance and diversity of reef fishes that are the foundation of dive tourism, but it also has venomous spines that represents a risk for tourists who engage in diving. Thus the quality of life of coastal communities is seriously threatened by the presence of this invasive species that has, and will continue to have, obvious economic impact to commercial activities of great importance, including tourism and fishing. Considering the level of colonization that the lionfish has reached so far, it is considered that eradication of the species is unlikely with currently available technologies. 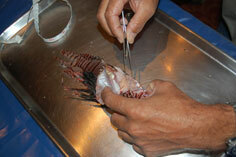 The best way to address this problem thus appears to promote control over the lionfish populations. Control is possible and happening in some specific areas with strong involvment (marine parks in México, Florida Keys, Cayman, Bonaire, and others). It has been found that control is an effective way to decrease the negative effects of lionfish, however the control schemes must be aligned and focused on common objectives throughout the Caribbean (regional strategy). Available resources and size of management area determine control level. Nevertheless, the colonization pattern of the species, I.e its capacity to move between sites, makes coordination and collaboration at the national and regional levels a key factor for success. In order to tackle the growing threat caused by the invasion of the Lionfish (Pterois miles and P. volitans) in the Wider Caribbean, UNEP-Caribbean Environment Programme and its Regional Activity Center for the Protocol on Specially Protected Areas and Wildlife of the Cartegena Convention (SPAW-RAC) have joined efforts with the International Coral Reef Initiative (ICRI) and partners like the government of Mexico and its Commission on Protected Areas (CONANP), the government of the USA and its National Oceanic and Atmospheric Administration (NOAA), REEF CHECK Dominican Republic, CABI, and representative caribbean experts, to address the lionfish issue in the Caribbean. An Ad Hoc Committee for the Caribbean Regional Response to Lionfish Invasion (also known as Regional Lionfish Committee - RLC) has been established to that purpose under the auspices of ICRI in November 2010. The last SPAW COP in October 2012 (COP 7) adopted the new workplan 2013-2014 including IAS and especially lionfish activities.